House annual 4,828, biennial 5,276 kWh. Reducing. Warm March and Mrs N-C in hospital. GSHP annual 2,823, biennial 3,266 kWh, triennial 3,051 kWh. Sunbox annual 3,816, biennial 3,141 kWh. Good, still rising. News wise, the same stories rattle on, Pistorius, searching for MH370 plane. Nottingham Forest still haven't won a game for weeks and sacked manager Billy Davies. 23 March 2014: Normally, I only publish figures fortnightly, but on this occasion, it's worth printing a weekly one because we have gone below the 5k/3k threshold in annual consumption. This March has been so warm and sunny so far that the heating has been off, whereas the average temperatures of March 2013 were the coldest for many years. We've had three weeks with almost no rain, and many mornings of sunshine. So the annual figures have dropped sharply. Sunbox annual 3,791 - still rising. Worldwide, the main news seems to be the same, a continuing search for the Malaysian airplane (some debris has been seen). 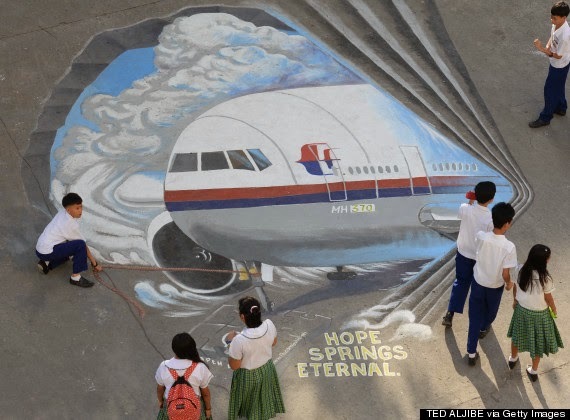 The image on the right is a pavement art by students, but the news source (Huff Post) doesn't say where it was painted. The Pistorius trial (too many inconsistencies in OP's account), the Crimea (and western efforts to find a way to punish Putin). The government's Budget seemed design to bribe the grey vote with a freeing up of Pension funds, although this will probably cause another rise in house prices. Arsene Wenger's 1000th game with Arsenal ended with a 6-0 beating by Chelsea, and Nottingham Forest got drubbed 5-0 by Derby. Oh, and the odious Fred Phelps of Westboro' Baptist Church died, that's some good news. 17 March 2014: The warm weather has continued, and my wife is back in hospital, so it's warm enough for a normal fit person to turn the heating off. The house metering figures look good, getting closer to the 5000-3000 threshold. House annual 5,020, biennial 5,298 kWh. Reducing. This March is a polar opposite to 2013. GSHP annual 3,002, biennial 3,280 kWh, triennial 3,061 kWh. Sunbox annual 3,734, biennial 3,107 kWh. Good, still rising. Worldwide, some of the same stories continue. The Malaysian jet is still missing although it is clear that it was deliberate human damage by the crew, as the communication systems were turned off, but the plane continued to fly for 5 hours.... but the satellites don't know where it was flying. The Pistorius trial continue, and with several lies or untruths from him, it is breaking the "trust me, I'm Oscar" nature of his defence. A man had a 3D reconstruction of his face made, using 3D printing. 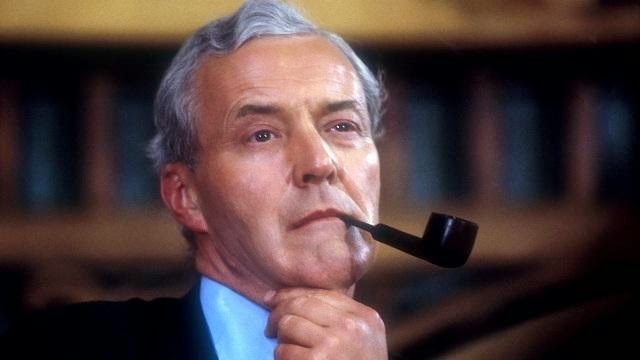 Tony Benn, one of the longest serving MPs died during the week at 88 (pictured), and suddenly all his enemies are singing his praises. Crimea had a referendum and opted to join the Russian Federation by a huge majority. The Winter Paralympics ended with a splending ceremony. NASA published a future-thinking report, that says basically, we are all doomed because of human greed. The rich countries and people go on consuming resources more quickly than the earth can provide. Although we think we are smart, the industrial and electronic culture in which we live is easily damaged. 10 March 2014: Well it was my birthday yesterday.. but enough of World News. I'm only printing annual figures fortnightly, but it's clear that so far March 2014 is being very warm, and March 2013 was the coldest on record (we had good snow in last week of Mar'13). There's a chance that the annual figures will reduce before the end of the month. Of the real World news, we've had Putin's occupation of Crimea, the Winter Paralympics starting, and the Malaysian Boeing 777 lost at sea with 239 on board. The Oscar Pistorius trial re-started... so much speculation, but sorry Oscar, I believe the witnesses who heard the shouting and screaming and shots. Bob Crow, the union leader for the transport workers died at the young age of 52. House annual 5,110, biennial 5,311 kWh. Reducing. It's been a mild winter. GSHP annual 3,072, biennial 3,284 kWh, triennial 3,068 kWh. Sunbox annual 3,598, biennial 3,050 kWh. Good, still higher than last year. Ground Temperature 10.8ºC - rising at last. World wide, it was the Oscars in Hollywood (wins for '12 Years a Slave' and 'Gravity'). The biggest story of all is the Russian occupation of the Crimean peninsula in Ukraine. As this is a mostly ethnic russian island-peninsula, it would seem a war-avoiding idea for Ukraine to cede this peninsula, and so far the bulletless war indicates that this is becoming the de- facto result. Embarrassing for the organisers of the Winter Paralympics due to start on Friday of this week. Embarrassing for western politicians who do not know how to deal with it (and forgetting that only a short time ago, they were threatening both Syria and Iran with bombing or military attack, taking sides with the rebels of Libya and Syria and fostering the breakaways of Kosovo and Montenegro. Nice Info! This free and perfect way to create power is a much better way to create energy for your home, and is more low rate than ever.